What is the right approach method for the professional salesperson to lead a buyer-seller interaction and achieve effective, efficient and consistent sales results? The pragmatist would probably answer, "Whatever works." From a tactical planning perspective, however, haphazard and disorganized efforts (more often than not) will produce two undesired outcomes: marginal productivity in the short term and an unmanageable sales practice over the long term. Tactical planning is the process of taking the sales call's strategic plan (see Necessary Condition #6 - The Right Approach Plan of Action) and breaking it down into well-defined call steps or procedures to execute the defined strategy. By so doing, the salesperson should be closer to achieving the pre-call objectives. Objectives, strategy and tactical plans are three essential components to achieving highly productive sales call results. As the architect of their customer's bridge-to-change, salespeople must learn to use these planning skills. Many salespeople fail to spend much time planning for their individual sales call success. As a consequence, sub-optimal, inconsistent outcomes and waste are too often the result. Many salespeople are inadequately trained and inherently lack the required focus or discipline. Also, the process of developing a useable tactical plan is not easy as some flexibility is necessitated to allow salesperson response to the chaotic state that naturally exists during individual sales call exchanges. Sound, tactical planning is essential to the sales call approach. By engaging in quality, strategic preparation, the salesperson can enhance productivity, make order out of chaos, and realize consistent productivity gains. Present your sales call story in four progressive courses or phases. Continually build your bridge-to-change for greater buying decision momentum and strength. Consistently practice heart selling, not hard selling. The four phases of the approach appointment are a set of interacting and interdependent movements to the sales call plan. Each phase should build on the previous step in an orderly progression. Also, the tactical plan should closely parallel the order contained in strategic plan's map, i.e. get the buyer's attention, develop interest for a change, build desire to change, provide validation and conviction to the suggested change, and gain commitment and close to implement the recommended change. To picture the four phases, consider a baseball diamond with each phase representing one of the diamond's four base paths. First, second and third bases represent key transition points in the planned buyer-seller exchange. 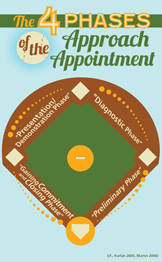 Home plate symbolizes both the beginning and the end of the sales approach. The sales call started there with the end in mind and the attendant formulation of the pre-call plan. It will also hopefully successfully finish there. Note: The illustrated individual sales call components that comprise the recommended four phases will vary according to individual salesperson styles and tactical thinking. What is presented here is offered as an example. The first base line's Preliminary Phase includes many sales concepts including the introduction, first impression, rapport building and attention getting. Also included herein are such items as the approach overview, which summarizes the meeting's proposed agenda, the confirmation of the appointment's time allocation, and the buying center review of who, how and when. First base might represent what is termed the diagnostic agreement or the transition to the diagnostic second phase. It is simply the salesperson gaining permission to begin with some investigative questions. sequential process of needs identification employing various types of questions (situation, problem, implication and needs payoff). Whatever method employed by a salesperson, the diagnostic or investigative phase should uncover what the prospect is seeking, why, and identify deficiencies and some form of resulting pain if not corrected. The prospective buyer wants to feel understood. Second base is the transition to the next critical phase, the Presentation/Demonstration Phase, which at this point in the relationship is often a preliminary offering. Some salespeople use this transition opportunity to summarize the critical issues or problems heretofore discovered and gain the buyer's confirmation. It is during this time that the seller should also invite the buyer to burn off any obvious resistance points to jointly working together. Some salespeople use this transition to address real objections, which should be positively viewed as windows to the buyer's hidden, inner soul. Another way to use the transition is to provide an overview or outline of the presentation's what, why and how to follow. During the Presentation/Demonstration Phase, it is critical to focus the discussion on specific benefits as opposed to an array of features. A benefit is engendered when the salesperson successfully matches or relates a feature or capability with a previously discovered and confirmed buyer need, want or problem. Salespeople need to be specific in emphasizing how the proposal correctly responds to the buyer's critical issues with comments such as, "What this feature/capability will do for you is... which is what I think we agreed you wanted to change/achieve." The presentation or demonstration can be significantly strengthened by orchestrating it as a joint effort. It is important to address the issues being analyzed and discussed as those of the buyer, not the salesperson. To own the solution, buyers must feel like they have been understood and they can now see or feel the solution or the proposed change working to resolve the discovered challenges. In other words, the buyer must own the solution. It is also during this phase that the salesperson must be ready to offer third-party proof, support, or validation for the efficacy of any proposed changes. Another key item to be addressed is price and the related incremental value considerations resulting from the proposed change. The consideration of price is always a relative concern to other value implications such as quality. The value proposition presented should be tailored to the metrics indicated by the buyer. The next transition opportunity is represented by third base and it is here that the salesperson needs to make a final attempt to assure that the buyer is connected to an offered product or service (solution) in an emotional ego state. The buying decision is mostly an emotional decision - meaning there is no reason to expect a successful close if the buyer hasn't emotionally connected to the proposal as a valid answer or solution to the previously agreed critical issues. At some point in phase three, the buyer needs to influence the seller's transition into the emotional state, or the state that ultimately influences the buying decision. One way to accomplish this is to offer an "imagine" inquiry or statement after confirming the value proposition's adequacy. For example, in an effort to "seed" the desired pro-buying emotion, a salesperson could offer something like, "Once we get this proposal implemented, imagine how relieved you will feel not having to be concerned about delayed order fulfillments and the disgruntled customers who have been complaining lately." Another real estate oriented statement might be, "Imagine how your family is going to enjoy the back yard entertainment area, especially the swimming pool on hot, summer days." Assuming it is used correctly, the word "imagine" can trigger a feeling or a vision-producing response from the buyer. The fourth and final phase is Gaining Commitment and Closing. Many salespeople have been trained to always "ask for the order." Having to make this request after all that has tactically preceded this point in the exchange is usually not a positive sign. If the salesperson has effectively delivered all of the phases, practiced professional active listening skills, and maintained a vigil of watching for non-verbal indicators of a either a positive or negative buying decision, then the desired close should be the buyer's asking something like, "This all sounds (or looks) great, (seller), what do we need to do to get this started?" Since the order close is often the best case sales call objective, salespeople should always go prepared with what is necessary to reach home plate or close, assuming that obtaining the order is a reasonable objective. Whatever a salesperson does at this point, implementing a buying decision should be made simple and easy to do. Each phase and its individual components should build on the previous phase's progress in an orderly progression. Although the components contained in each phase will vary based on the salesperson and the customer, the salesperson should not "leapfrog" phases. To do so only defeats the purpose of a more disciplined approach to quality sales results. It is also important for the seller to be always working on improving the structural strength of the bridge-to-change under construction. The salesperson does this by consistently adding buying momentum linkages and regularly taking the buyer's ready-to-purchase pulse. The key structural ingredients to building buying momentum and infusing strength in your buyer's bridge-to-change are the buyer's regularly invited verbal confirmations or "yes" linkages. Some sales trainers insist that salespeople should always be closing (the ABCs of selling). In the context of our four phases, this would invite an undesirable leapfrog effect. On the other hand, assuming the suggested "closing" is getting positive "yes" responses from our buyers as we move through each individual step of our four phases should serve to strengthen our probability of a desired outcome by adding momentum to the buyer-seller exchange. In the context of our tactical plan's execution, this may call for twenty or more buyer confirmations. Dr. Robert Cialdini in his highly regarded book, Yes! 50 Scientific Ways to be Persuasive, defines six "Weapons of Influence." One of those is commitment and consistency. In brief, if people commit, orally or in writing, to an idea or goal, they are more likely to honor that commitment. Even if the original incentive or motivation is removed after they have already agreed, they will tend to honor their commitment. When one's words and actions are inconsistent, tension is created and social pressure comes into play. If a buyer acts inconsistently with the positive responses yielded throughout a sales call exchange, the effect of this is that a prospective buyer tends to feel that others (the seller) will see him/her as being untrustworthy and unbelievable (at best), and unworthy of their attention (at worst). Soliciting and gaining regular confirmations throughout interactive sales calls is an essential influencer to the seller's achieving the desired objective, a close or getting the buyer to take a positive action step. Sellers should seek to establish a trust-filled relationship with the prospect, including being consistent in their sales approach, so that appropriate sales will be earned or naturally flow from the developed relationship and traditional closes will not be required or employed. In other words, help buyers to consistently realize value-adding solutions to jointly discovered issues in a highly persuasive pro-relationship manner. Viewing the salesperson's tactical role in the typical buyer-seller exchange as a "helping others to buy" process versus "selling" is a critical distinction for highly effective sales results. The role differences seem trivial, almost a play on words, but in action they are widely different. Selling from a "helping others to buy" mindset is an integral component to Heart Selling. Selling using a traditional salesperson mindset invites a "what's in it for me" sales approach with too many long-term relationship-burdening side effects. As we will discuss in Right Condition #8 - The Right Outcome, we should always seek a win-win outcome from selling efforts; however, who is supposed to win first? At a minimum, buyers must perceive that the recommended changes produce measurable positive gains for them. Once a salesperson adopts a "helping others to buy" sales tactic perspective, the salesperson opens the door to a paradigm shift in the approach method and the buyer-seller dynamics contained therein. Highly regarded motivational speaker, Zig Ziglar, is often credited with the phrase, "People don't care how much you know until they know how much you care." Central to the concept of Heart Selling and its nurturing style is how it is designed to connect the heart of change - the buyer's emotions and their trust in the seller's intent and capabilities. There is an acronym, LOVE, that summarizes the critical salesperson interpersonal skills necessary for selling from the heart mode. Listen actively for answers to the counselor or diagnostic questions that best get to the heart of the buyer's needs and wants while minimizing the buyer's natural resistance to change. Overcome the "diagnosed" buyer challenges/issues through empathetic understanding. Validate proposed jointly-designed changes or solutions with third-party generated proof or evidence. Exceed, if financially feasible, the buyer's relationship and post-change performance expectations. Develop a progressive, four-phase diagnostic approach to lead the buyer to a value-enhancing outcome by developing benefits, i.e. the successful matching of the seller's capabilities to the buyer's challenges. Continually work to build a stronger bridge-to-change by developing buying momentum or influence through jointly working the pain-to-change-to-gain sequential process and the consistent obtaining of confirmation of thoughts, issues, pain and potential solutions from the buyer. Adopt the role of being a customer-centric guide and employ the essential skills of Heart Selling - active listening, empathetic understanding, proposal validations, and exceed the buyer's reasonable expectations of performance. Kurlan, David (2005), Baseline Selling: How to Become a Sales Superstar by Using What You Already Know About the Game of Baseball, Bloomington, IN: AuthorHouse. Martin, Steve W. (2006), Heavy Hitter Selling: How Successful Salespeople Use Language and Intuition to Persuade Customers to Buy, Hoboken, NJ: John Wiley & Sons, Inc.